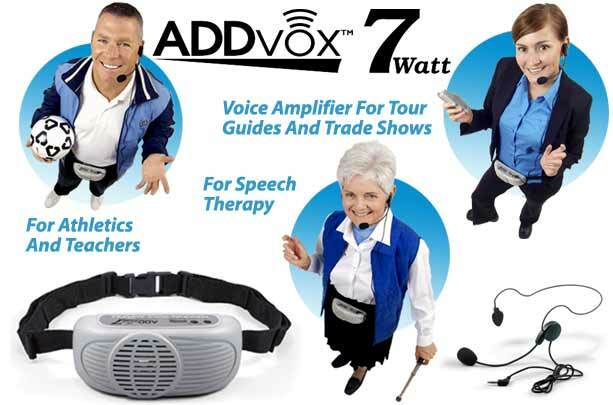 ADDvox, The 7 Watt Portable Voice Amplifier that Increases Vocal Output Without Increasing Vocal Strain. Capable of increasing voice volume up to 15db without any feedback, the 7 watt ADDvox7 is ideal for assisting communication in noisy environments such as a restaurant or crowded room. Designed to elevate the vocal volume of people with temporary or permanent voice impairments and to assist those who rely on an electronic speech aid, voice prosthesis or use esophageal speech; the ADDvox7 is also well-suited for other dynamic applications. For tour guides, aerobics instructors, athletic coaches and trade show personnel, this portable voice amplification system is the product of choice. The ADDvox 7 Watt Personal Voice Amplifier has a lightweight headset style microphone that picks up even the slightest whisper and remains comfortably in place for extended use. For maximum efficiency, its 7 watt amplifier has a built-in high capacity Nickel Metal-Hydride (NiMH) rechargeable power system which provides up to 14 hours of continuous use following an overnight charge. Extremely lightweight (only 1lb., 1.4 oz. with batteries), the ADDvox7 amplifier is comfortably worn at the front of the waist. Available with choice of a 110 volt Charger or 220 volt Charger for travel. ADDvox 7 Kit includes waist band Amplifier /Speaker, Lapel and Headset Microphones, a Travel/Storage Case, and 8 NiMH Batteries with Charger (choice of 110v or 220v). 1 year Warranty on Amplifier, 6 month Warranty on Microphone and Batteries. Amazingly thin and lightweight, the flesh tone colored FeatherLite Pro Headset is nearly invisible when in use. It's so comfortable and light that you'll forget you have it on your head. This professional quality ear hook style headset microphone was originally designed for theater professionals, but can be used by anyone who demands the best in comfort and performance. Only $129.95! Click here for more information! Save $140.95 when you buy the Bundle. Get a complete ADDvox 7 Watt Personal Voice Amplifier Kit with a FeatherLite� Pro Headset Microphone Upgrade for only $258.95! Click here for more information on this special offer! Replacement Chargers For ADDvox 7 Watt Replacement Charger for Addvox7. Available in 110v or 220v (foreign) versions. Replacement Batteries For ADDvox 7 Watt 8 AA NiMH (1.2v rechargeable) batteries are 2600 mAh. Change all 8 batteries at the same time. Note: batteries should be removed from amplifier when the unit is not in use for a long period of time. Replacement Headset Microphone For ADDvox 7 Watt Replacement Headset Microphone with 36" long cord and windscreen. Has "L" shaped 3.5 mm condenser input jack. 6 month Warranty. Replacement Lapel Microphone For ADDvox 7 Watt Replacement Lapel Microphone with 36" long cord and windscreen. Has "L" shaped 3.5 mm condenser input jack. 6 month Warranty. Replacement Windscreens for ADDvox 7 Watt Microphones Black foam windscreen is designed to fit either the Lapel or Headset Microphone. Package of 2. 3 Hour Smart Charger with 4 Batteries For ADDvox 7 Watt Personal Voice Amplifier and ChatterVox. For ADDvox 7 Watt Personal Voice Amplifier and ChatterVox. Compact and lightweight, this microprocessor driven intelligent Smart Charger charges most AA and AAA NiMh and NiCD batteries in about 3 hours. Two independent circuits are each capable of charging a pair of either 2 AA or 2 AAA NiMH or NiCD batteries simultaneously. Comes with 4 rechargeable AA 2600 mAh NiMH batteries in storage case. Uses 110-120 volt, U.S. Includes power adapter for cigarette lighter style power outlets in cars. Click here for more information.